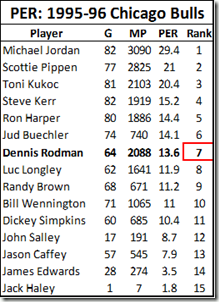 Dennis Rodman has dominated Rebounding Percentage more than anyone has dominated any major stat. 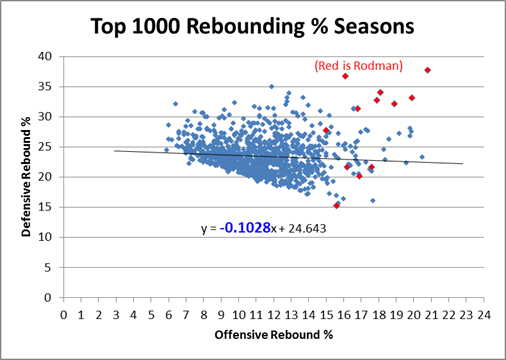 Before Rodman, we should have expected a rebounder of that quality to appear about once every 400 years. 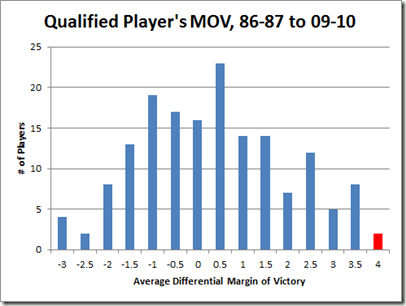 The trade-off between offensive and defensive rebounding exists, and is generally a completely separate phenomenon from rebounding ability. 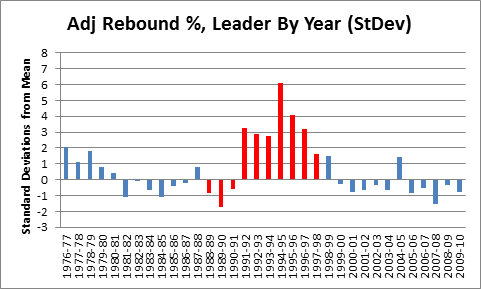 Rebounding percentage correlates more strongly with winning than points per game. Added: Individual rebounding percentage has a more causative effect on team rebounding percentage than individual PPG does on team PPG. Winning is a provably existent skill, separate from scoring and allowing points. 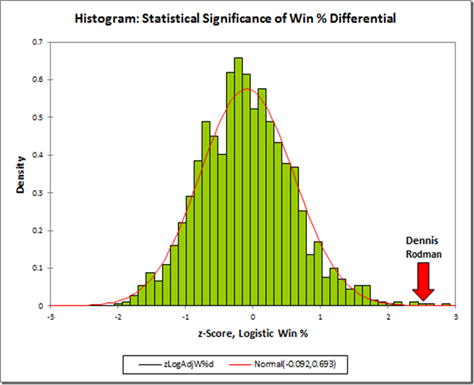 Rodman’s win differentials alone are statistically significant well beyond the 99% level of confidence. 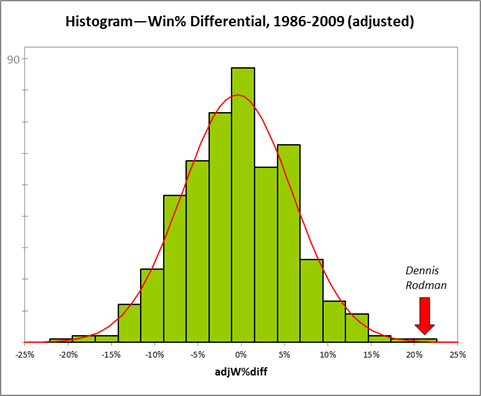 Looking at the overall statistical significance for player win differentials over the broadest possible pool of 1539 players, Rodman ranks between 2st and 8th, depending on your preferred metric. 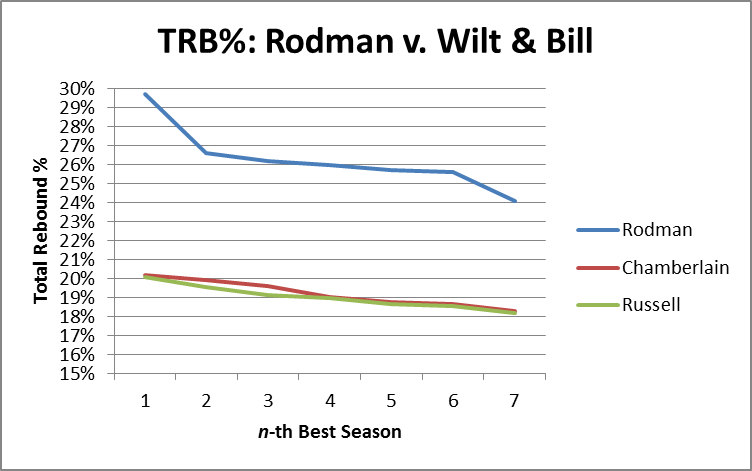 Rodman’s average ranking across metrics is second only to Shaquille O’Neal (who’s sample includes over twice as many qualifying games). 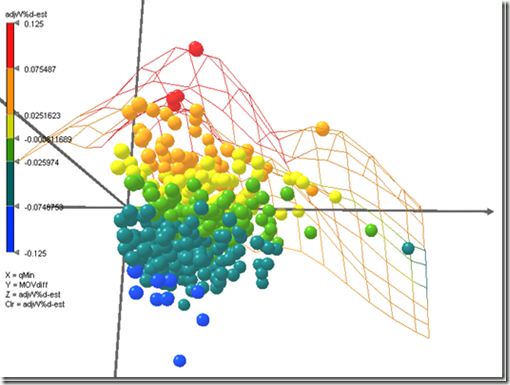 Introduce “Black Box” as a term for when variance gets eaten up by events that have binary outcomes. 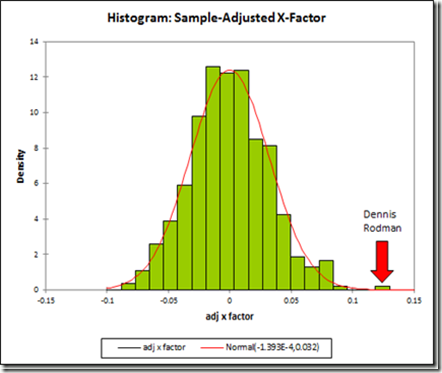 3/4(b) Rodman’s X-Factor 3/4(c) Beyond Margin of Victory 3/4(d) Endgame: Statistical Significance 4/4(a): All-Hall? 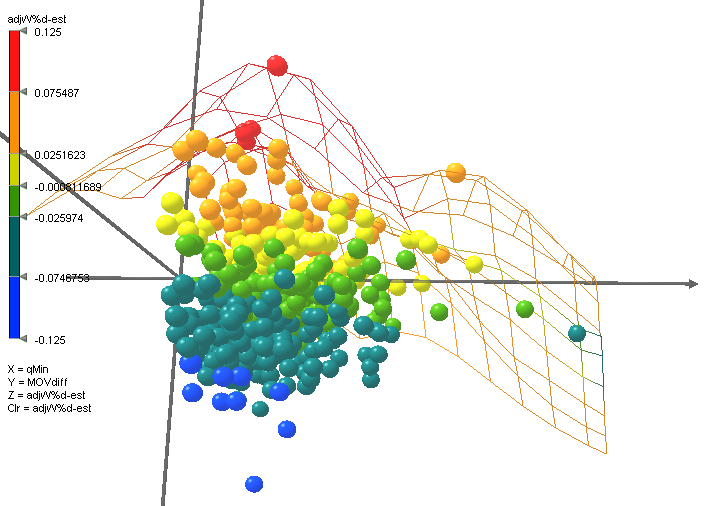 Awesome, I had forgotten how much information was in the earlier posts, great series all around. What can we be expecting next? I’m glad to see that our conversation from the firm holiday party made it into not one, but several blog posts. I wonder how Kevin Love’s stats this season — closing in on the consecutive double-double mark, leading the league in rebounding (per game and per 40) — compare to those of the Worm. Though Love’s accomplishments are pretty impressive, maybe he is just stealing rebounds from his teammates. And he sure can’t be contributing much in the win column. I actually had a long conversation about Love at the SSAC yesterday. He definitely seems to be having a statistically rare season. The biggest problem with him is that, in the NBA, great players pretty much don’t lose ever. He’s going on his third straight season with a winrate of <30%. The only marquee players to do this in any seasons over the past 30 years are Dwyane Wade (who did it once) and Pau Gasol (twice). Wilt was a great player, but his team set a record for losses the season he was traded to the 76ers, and about half of the losses occurred on the half-season he played for the Warriors. The 76ers soon set a record for wins in a season. 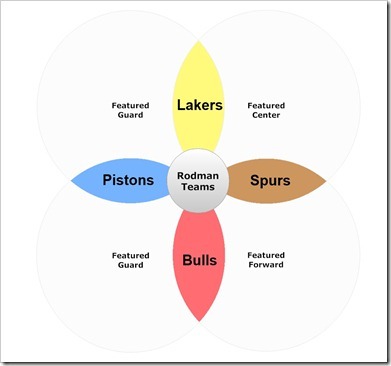 Team game. Hi guys, new to the site. 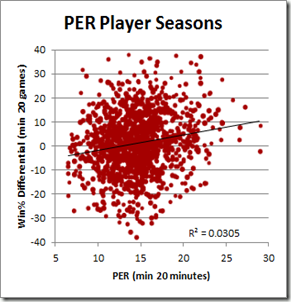 How would you respond to the assertation that RB% does not work for “role players” (can be defined as players who don’t play the most on their team) since they can expend more energy on rebounds/get more rest, etc. 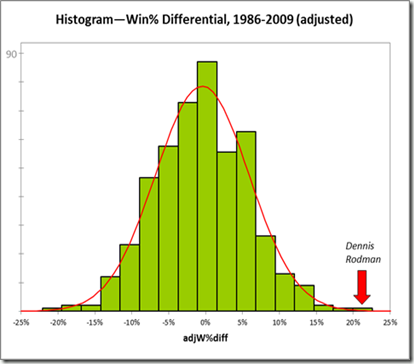 Rodman didn’t necessarily play the number of minutes you’d expect from an elite player; that said, he still compiled otherwordly rate-stats (RPG, RP40, etc). 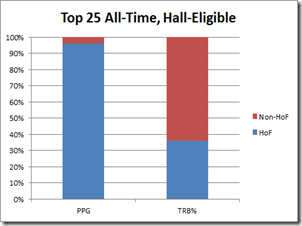 Do you feel RB% has this limitation? 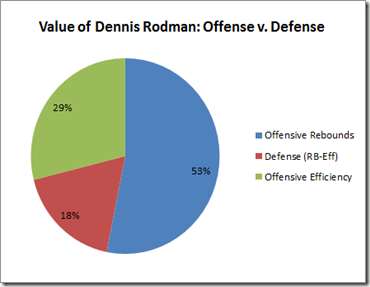 Yes, I would say RB% is definitely affected by role, as is virtually every other stat. I’ve looked at this (but not read every single word) but how do you go from his point margin difference with and without, which is barely ahead of others, and come back with the incredible high winning %? I’m with you through 3A. How do you go from a point margin barely better than number 2 to a winning % far better than anyone else? 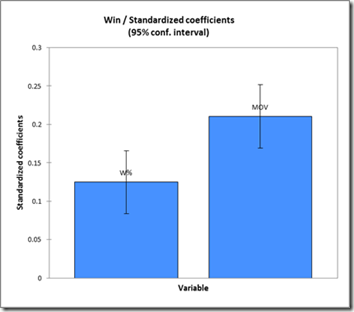 The Win% differential is calculated separately using the method described. 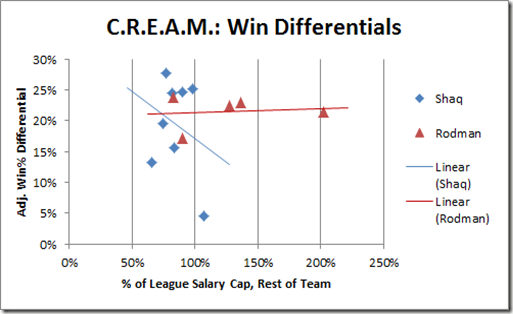 It isn’t projected based on points, it’s the actual difference in his teams’ winning percentages with and without him. 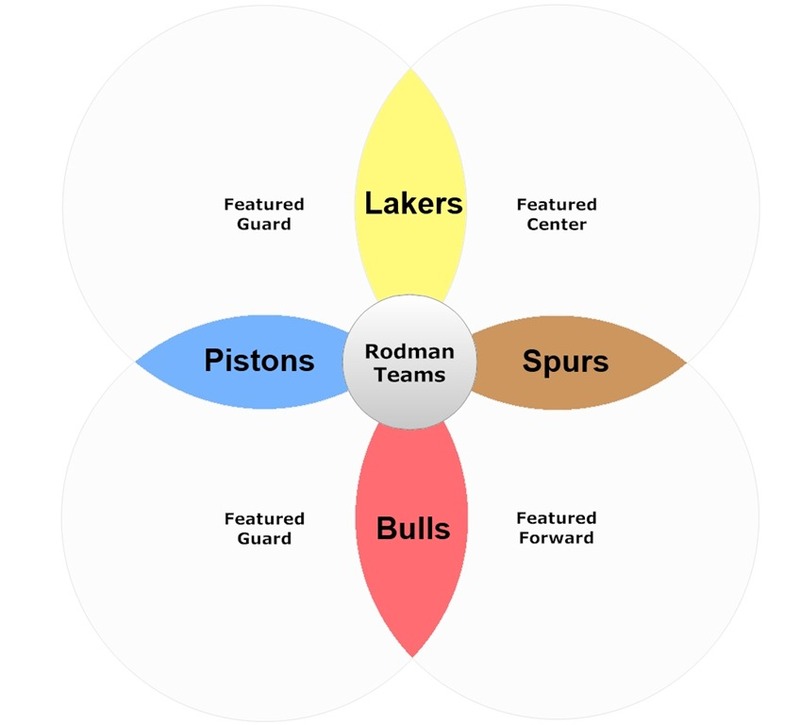 Rodman’ benefits greatly from a .381 differential from the 95 pistons, which had the 20 game minimum you used. 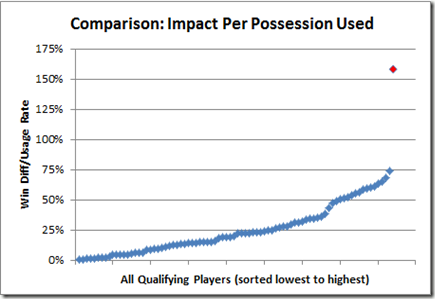 Had you used 21 games for your cut-off (1/4 of the season, rounded up) you would have different results. 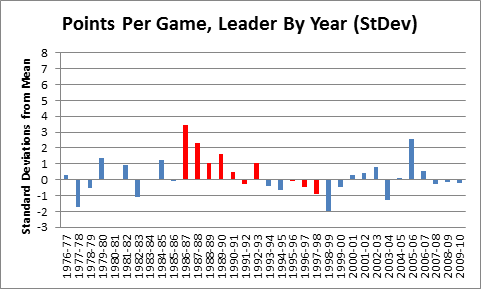 Fair enough, but I don’t think the point is particularly probative: His differential was high with every team he played for, and can drop a data point or two and still be one of or the best ever. 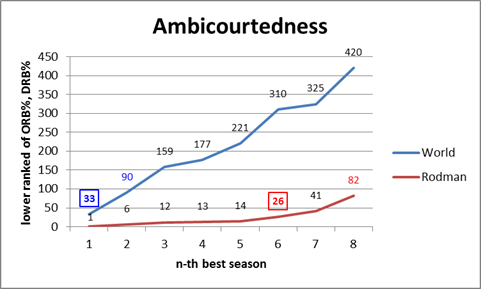 I don’t have the data in front of me, but to dampen outlier seasons for whatever reason (such as age, or, incidentally, a better example is Ron Artest, whose suspension after the “Malice in the Palace” coincided with many team-mates and inflates his career differential substantially), I tried dropping each player’s “best” and “worst” impact years, and it had little effect that would be relevant to this analysis (aside from dramatically shrinking the pool of qualifying players). 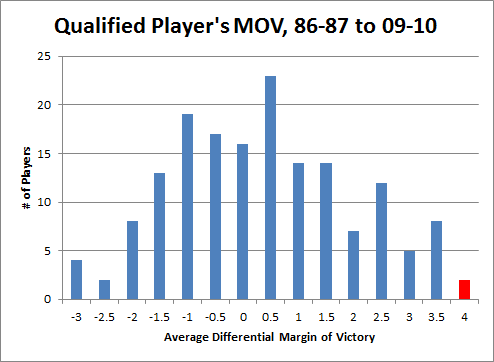 You also get MJ who has only one qualifying season – 2002 Washington after 2 retirements where is differential is still .182. His return season 1995 had 17 games and he had a differential of .242 – if I weight those 2 you get .208 – and neither season was his peak. This is such a cherry picking exercise that it doesn’t really mean a lot. Meh, you have to draw a line somewhere. 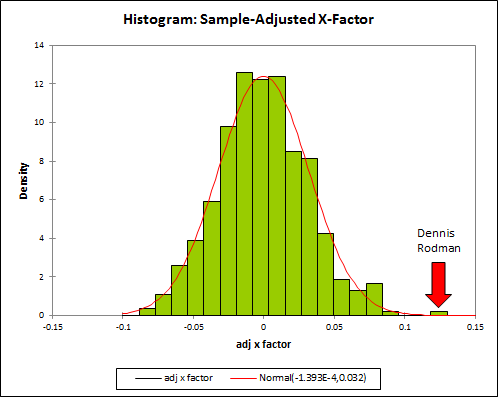 I was acutely aware of the fact that adjusting the filters a small amount one way or another would include or exclude certain players and/or be more or less favorable to them. 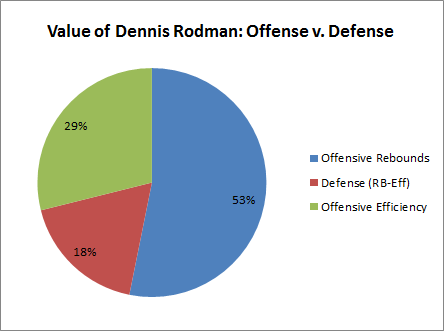 So I tried to set lines that were general, rationalizable on their own terms, and as effective and probative as possible with my particular goal in mind: evaluating Dennis Rodman. 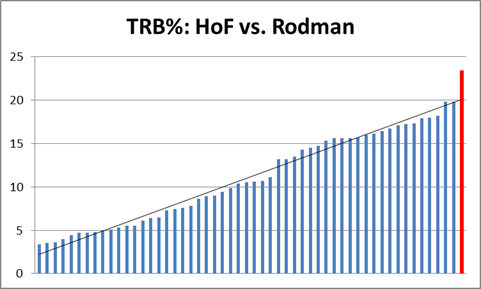 There’s a constant trade-off between breadth and accuracy, and I went with a balance that I thought best for testing my hypothesis about Rodman having HOF-level value. If you read the last post in this series, you know that I agree MJ’s Win % diff is probably higher than Rodman’s (though, given sample sizes, it is not more statistically significant). 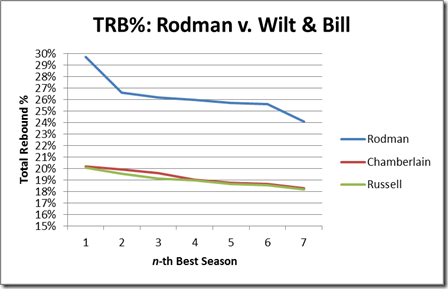 I have also noted in several different places that I think Rodman has certain advantages in these comparisons: For example, he missed a relatively high percentage of games due to suspension rather than injury, and he didn’t stay around in the league several years past his prime as many other great players did. 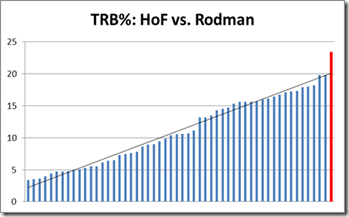 But the fact that there are large margins of error is offset by Rodman’s statistically extreme performance. The whole point of showing that he comes out on top in this reasonably broad pool of players isn’t to show that he is actually the best, but to show how unlikely it is that he wasn’t very very good. 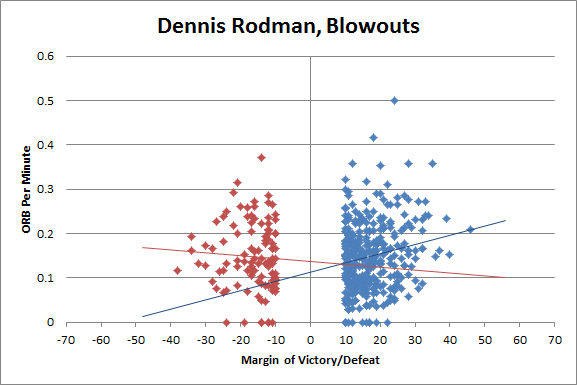 In the “Outlier in motion” graph, Rodman seems to make a huge statistical leap in rebounding prowess between the 1990 and 1991 season. What’s happening there? 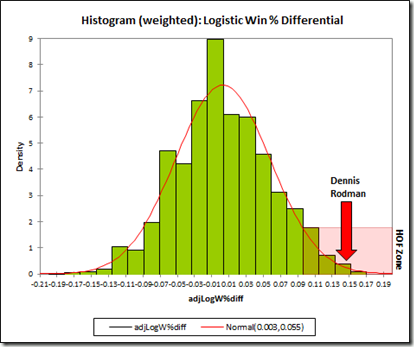 Did his MOV or win% diff also change noticeably (assuming we have a large enough sample size)? If we’re looking for the bizarre loophole, maybe looking at other examples of large statistical leaps from year to year+1 would yield worthwhile insights. As probably the only Brazilian that is an NBA fan AND graduated in Statistics, I really thank for this article.